Kai Captain Excelia Straight Razor. The KAI Captain Razor is a professional precision instrument suitable for both shaving and hair dressing. The blade was originally designed for surgical application and features extraordinary sharpness and cutting edge durability. Thanks to the special dispenser system the blades can be safely and quickly inserted in the razor holder. Made of high quality surgical steel and long life. Non-slip handle. 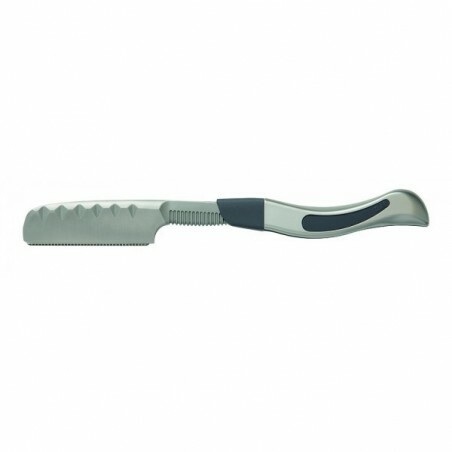 The ergonomically contoured KASHO Designing Razor is an ideal tool for creative work. The exceptional sharpness of the blade, which was originally designed for use in surgery, enables accurate shaping and thinning of hair. The synthetic comb containing antibacterial and anti-static elements symmetrically forms on the both sides of the blade without gaps. Therefore it is very hygienic and free from static charge and clogging of hair.